Well, that’s a clear indication of things to come. The BIG DATE is round the corner. Perhaps it is even bigger than 16th October 1998 when Karan Johar made a huge splash with his Shahrukh Khan, Kajol and Rani Mukerji starrer Kuch Kuch Hota Hai. 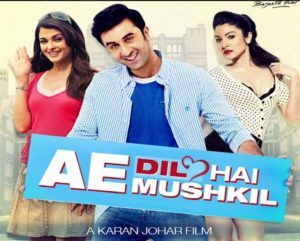 Now that he has Ranbir Kapoor, Aishwarya Rai Bachchan and Anushka Sharma at his disposal, the release of Ae Dil Hai Mushkil becomes all the more important. However, major romantic disappointments like Mirzya, Baar Baar Dekho and Fitoor made one wary around the fate of romantic entertainers in Bollywood. The way Ae Dil Hai Mushkil appears though, it is clearly in line with the times as audiences have been intrigued well enough by the film’s plotline, which has been smartly revealed just in bits and pieces. Now with just a week remaining for the arrival of this musical by Pritam, one can well expect some good Diwali entertainment in play at theaters.